2000BPH Water bottling plant automatic accomplish whole process from blowing bottle,water purify,washing, negative pressure, filling, settle cap, buckle cap till screw cap, bottle labeling, bottle printing, bottle packing. 2000BPH Auto Water Bottling Plant is love by most of our customer. It has advantages, such as high automation level, compact structure, beautiful appearance, convenient and simple operation, safe and reliable and adjustable continuous production capacity and others. It is mainly suitable for bottling of round or square polyester bottles. According to the demands of different specifications of users, it is only changed a little in design to meet the user’s demands. RO Water Treatment Machine is mostly use in pure water treatment and mineral water purification.The water purification is the removal of contaminants from untreated water to produce drinking water that is pure enough for its intended use, most commonly human consumption. Fully Automatic Two Cavities PET Plastic Bottle Blow Molding Machine are suitable for producing PET plastic containers and bottles in all shapes. They are widely used to produce the carbonated bottle, mineral water, pesticide bottle oil bottle cosmetics, wide-mouth bottle and hot fill bottle and so on. 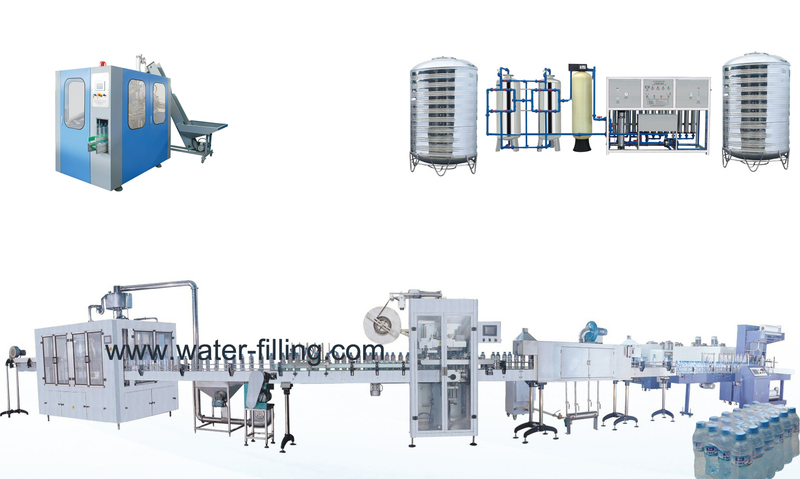 This water bottling equipment is mainly used for washing, filing, and capping non-gas liquid, such as mineral water, pure water, and more. The hanging bottle-conveying structure of the water bottling equipment makes the changing of bottle models faster, easier and more convenient. The main machine makes use of advanced PLC control technology. Meanwhile, we adopt internationally famous products for our key electric elements. Automatic cutting and sleeve a label on the pass bottled water. Then the label will shrink and got tight on the bottle when the bottled water pass the shrink tunnel. New type bottle label steam shrinkage tunnel, label shrinkage steam machine, label steam shrinkage tunnel, label steam tunnel, shrinkage effciency greatly hence; regarding differ and abnormal round,square,flat bottle ect bottle type, adjustment and maintain is convenient, shrinkage is flat. Auto shrink packager is used for packing beverage, beer, pure water, juice, etc whatever it is without pallet, catoon, rectangle, round or flat shape. It has the advantage of less cost and better appearance. It applies PLC automatic controller, man-machine interface, ensure that no fallen bottle, no bottle shortage. It adjusts flexible, safe and beautiful. The adjustable hot wind recycle structure make machine suits for all kinds of thermal films(including color printing). Replace film conveniently. It has failure alarm, lock device, reliable running.